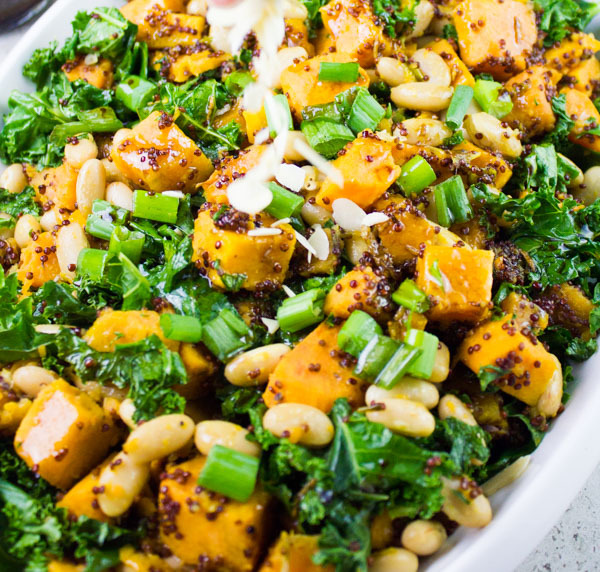 A simple yet flavorful and satisfying sweet potato salad with high-protein add-ins like quinoa and navy beans as well as superfood kale! A simple balsamic dressing adds a touch of sweetness to this healthy vegan one-pot dish. Have you had enough salads this month already? 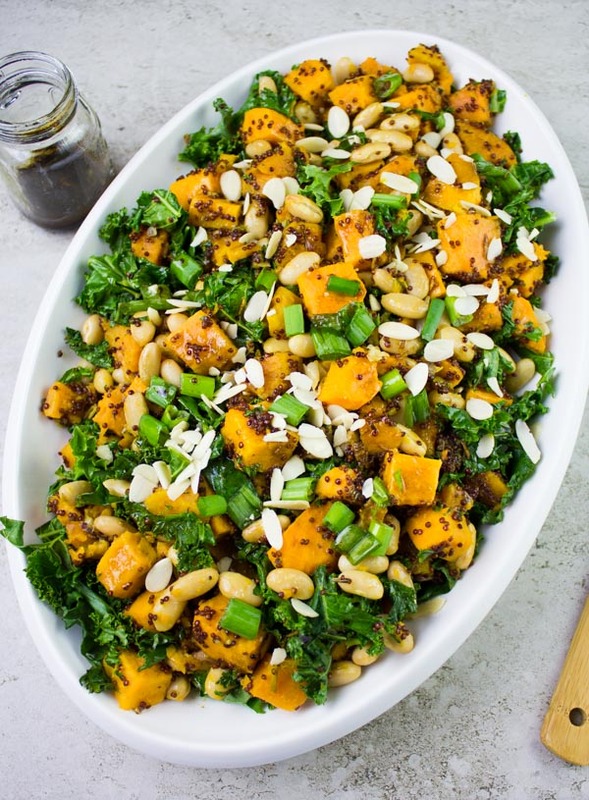 Just make room for this one, just this One Pot Quinoa Sweet Potato Salad Recipe. It’s not exactly your typical salad, it’s a warm one-pot vegetarian and vegan meal, perfect for lunch. There are some recipes that you can’t go wrong with in life. These great recipes are mostly those that offer pure comfort with mostly classic flavors and ingredients. 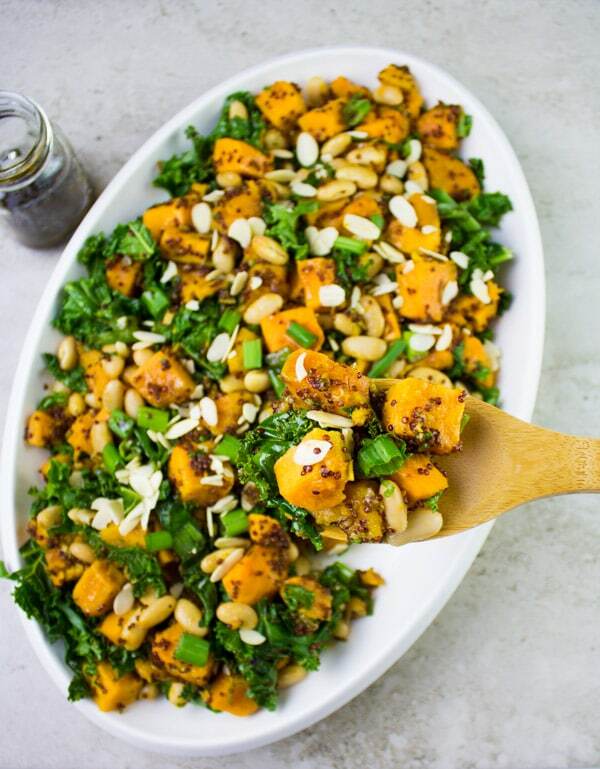 Today’s sweet potato salad fits right into this category. Easy, simple, quick and pure delicious comfort love. Sometimes all you need is a foolproof salad recipe. Nothing too fancy or out of the norm with classic ingredients and flavors, as well as a really simple technique! A quick salad recipe that tastes like homemade comfort and is also Kid friendly! This One Pot Quinoa Sweet Potato Salad fits the bill. Let’s start with how the sweet potato is cooked perfectly with no water, boiling, roasting or mess. I teach this technique all the time at the coking school and every single person who came in and made it has never gone back. The ultimate best way to cook sweet potatoes (or regular potatoes as a matter of fact), whether for mashing or for using them cubed as they are is on your stove using a pan. Do you remember this amazing sweet potato gratin recipe? I explain much about it there. Basically, you’ll sauté the sweet potatoes in a bit of butter or olive oil, turn the heat to low and cover the pan tightly. The sweet potatoes will cook and steam in their own juices. No extra water added. And if you want to add onion, garlic or any flavors to the sweet potatoes, you just simply sauté them first before adding the sweet potatoes to your pan. It’s that simple, easy and brilliant. Once they’re fork tender, the sweet potatoes can be mashed or left whole. Once the sweet potatoes are fork tender, the quinoa will be tender with a slight bite (perfect for texture), you’ll then add in some white navy beans. 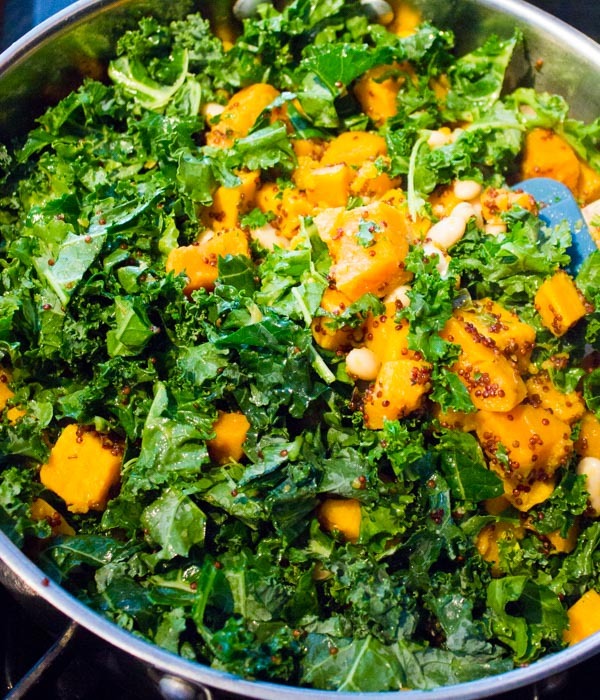 The beans will just cook for a couple of minutes with sweet potatoes and quinoa before I turn off the heat, add in some chopped fresh kale and cover the pot. The kale will wilt slightly from the heat in the pan for a couple of minutes. And it’s DONE! 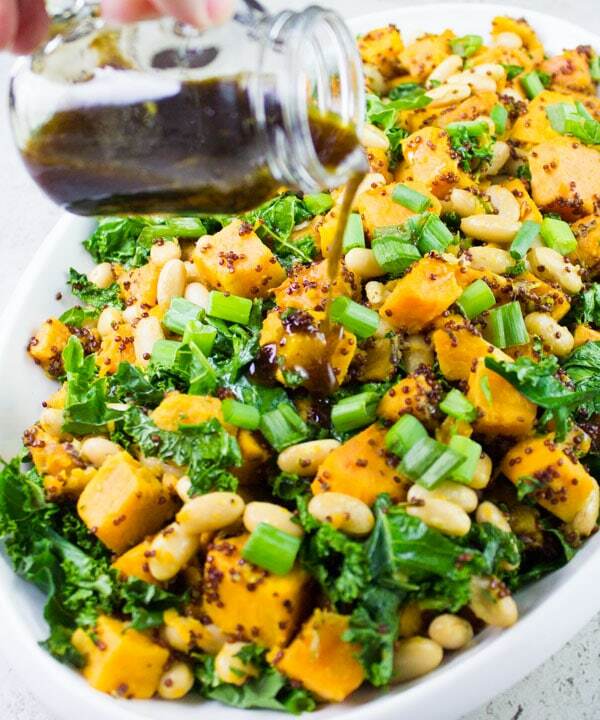 I finish off the Sweet Potato Salad with a basic straightforward balsamic dressing. You can make a really fancy basil balsamic like the one in this Blackberry Pecan Roast Veggie Power Salad, or keep it a simple balsamic vinegar and olive oil one. Either way—it tastes GREAT! No matter how sick of salads you’ve been this month—PLEASE make room for this One-Pot Quinoa Sweet Potato Salad. And don’t think of it as a salad, it’s really more of a side dish or a full meal. Enjoy! Instead of navy beans, use chickpeas, black beans or lentils. 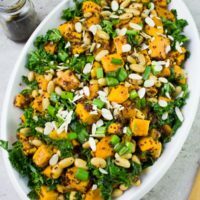 I love sprinkling some slivered almonds and some chopped scallions on the top of my sweet potato salad. Other great additions are some chopped tomatoes, sweet bell peppers, broccoli or arugula. Preheat a wide pot with a lid over medium-high heat, and add in the olive oil or butter. Sautee the scallions for one minute over medium-high heat and then add in the sweet potatoes, quinoa, seasoning and sauté for 1-2 minutes over medium-high heat. Add the water and cover the pot firmly. Lower the heat to low and allow the sweet potatoes too cook for about 15-18 minutes. Check the sweet potatoes with a fork, when it’s fork tender, it’s ready. Add the white navy beans, toss them with the sweet potatoes and let them cook for two more minutes then turn off the heat. Add the kale, seasoning and toss the kale with the sweet potato mixture. Then cover the pot and let the kale wilt from the heat in the pan for 2-5 minutes. Plate the salad, sprinkle extra almonds and scallions (optional). For the dressing, mix all the ingredients in a bowl and pour over the salad. Enjoy warm. This is one delicious looking potato salad. Amazing that you used sweet potatoes. Such a delicious dish for fall! This will definitley be added to all of my holiday dinners this season. 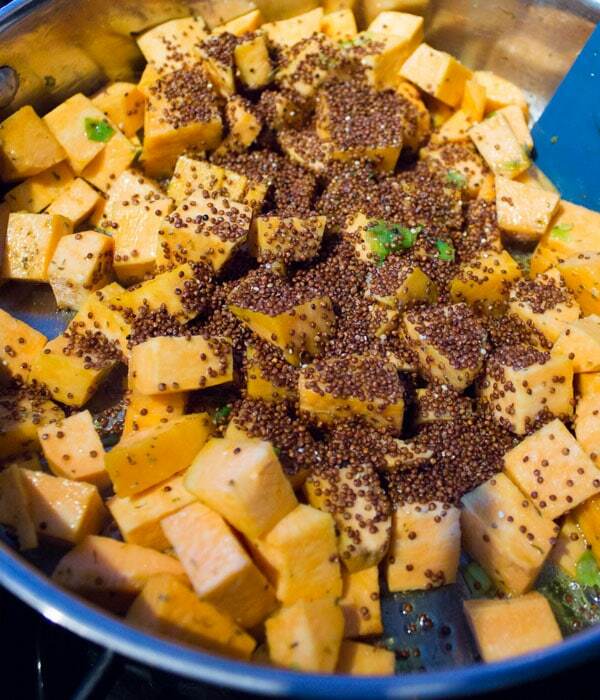 I love quinoa and sweet potatoes but never thought about putting them both in the same dish. I’ve gotta try this recipe! Looks so festive and yummy! Love everything about this, adding to my list of must makes this fall! I love this idea! 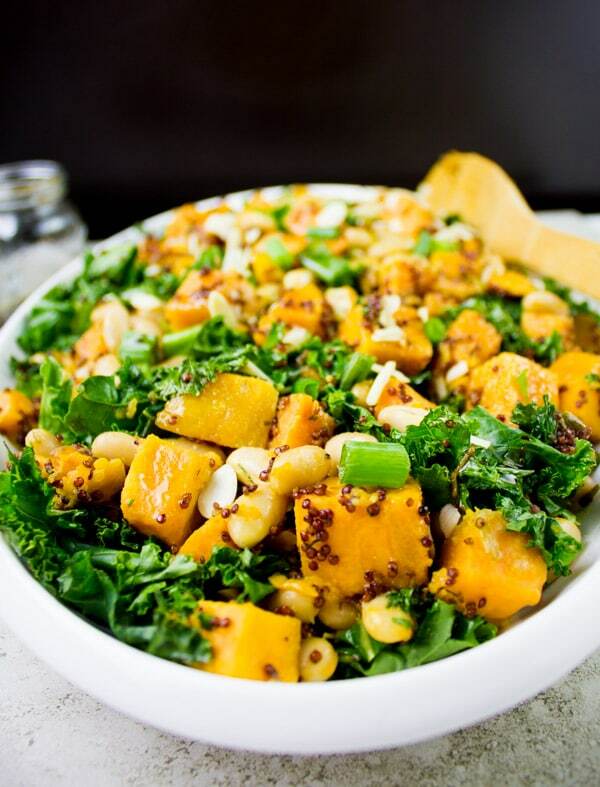 Looks like the perfect fall salad! 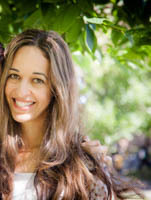 Hope you make it soon!! I could eat this for lunch every day! So delicious! I’m making this right now. My quinoa didn’t cook. It’s still raw and crunchy. What did I do wrong?? Hi Allie, usually depending on the size of your cut up sweet potatoes, your cooking time will vary between 10-15 minutes. 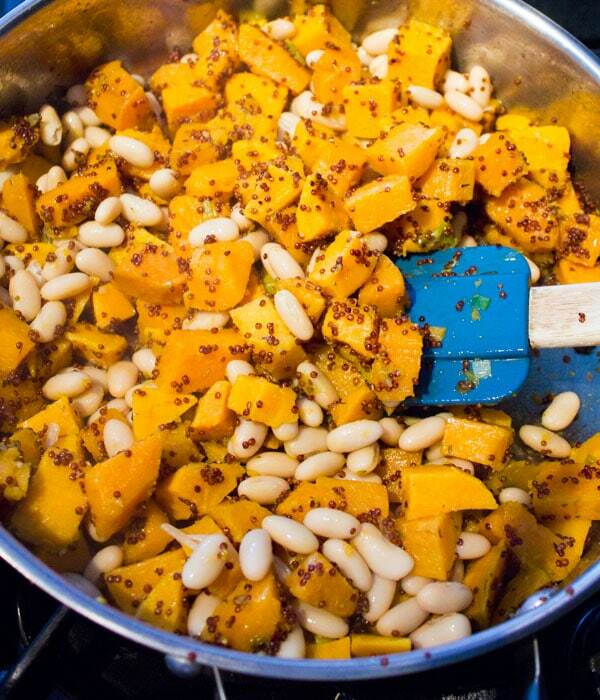 If you’ve cut the sweet potatoes too small, the quinoa wont have enough time to fully cook. In that case, you can add a couple tablespoons of water to help the quinoa cook faster. In all cases, it wont be soft and mushy quinoa, it’ll always a bite but it’ll be cooked not crunchy. Please try it again!! This is such a good one!